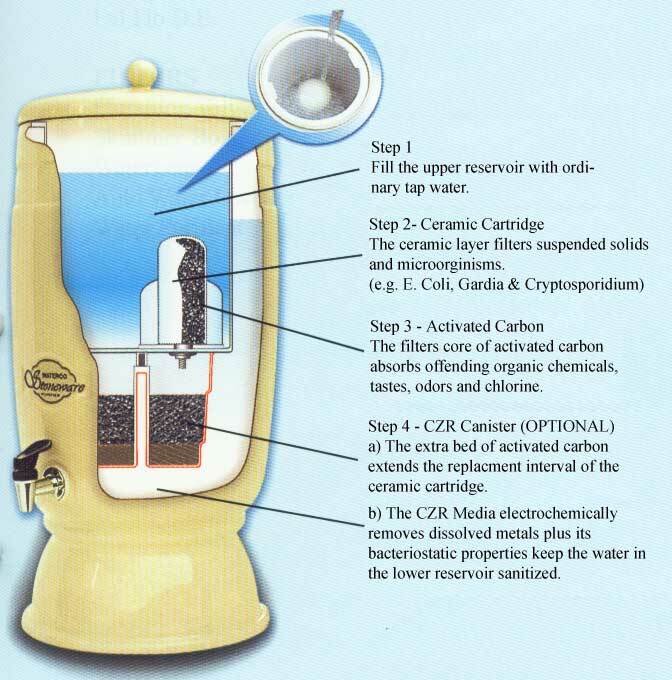 This water purifier uses the power of gravity to pull tap water firstly through its ceramic filter cartridge, then through activated carbon to deliver pure drinking water. Made from porcelain, this portable unit requires no plumbing work, as it will operate as soon as you fill the upper reservoir with water. This filter eliminates harmful bacteria, dirt, chlorine, organic pesticides and dissolved metals from your drinking water. 1. Gravity Water Purifier should filter approximately 1L/hour. If you are experiencing an unusually slow flow rate; soak the Waterco Ceramic Cartridge in a mug of water for 30 - 45 minutes with the plastic nozzle pointing upwards and above the water level. This procedure will remove trapped air in the cartridge. 2. Ensure that the filtered water is turned over at least once a day. To prevent algae, wipe the Gravity Water Purifier’s inner walls once a week. 3. The CZR media should never be allowed to dry out. a) The bacteriostatic effect ( of theCZR ) will be “ switched off “ if the filtered water is not physically kept in contact with the CZR. b) The drying process will cause the CZR particles to adhere together. It will be difficult to pass water through such media as it has become “ blocked up “.